► No need of approval or permission from authorities. ► No need of battery. ► When solar energy is sufficient then total output load will operate on Solar through Flyline inverter. 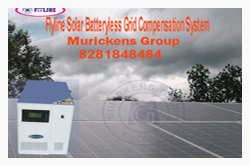 ► When solar energy is weak then Flyline inverter is taking balance power from grid . ► When solar energy is absent then the entire load is working on grid. ► It will work on Solar as well as grid. ► Compensating Type – First preference solar and second preference grid. ► Eg. : If we install 5 KVA power conditioner unit (PCV) on-grid model with 3 KW solar panel for generating power, we draw 5 KVA load with a discharging difference of 2 KVA which will be taken from the grid. ► We get full utilization of solar power. ► Pure sine wave out put. ► ISO: 9001 -2015 Certified solar power conditioner. ► It will not support the backup power. ► Work with solar power, the best way to save money using natural resource. ► Pollution free type. ► Protection from lightening, ► Over Load Protection. ► Independent Digital display inverter input and out put voltage, load, etc. ► Audio and Visual Indicators. ► Can connect to the existing wiring. ► No husking sound. ► It is a fully automatic built-in charging control.